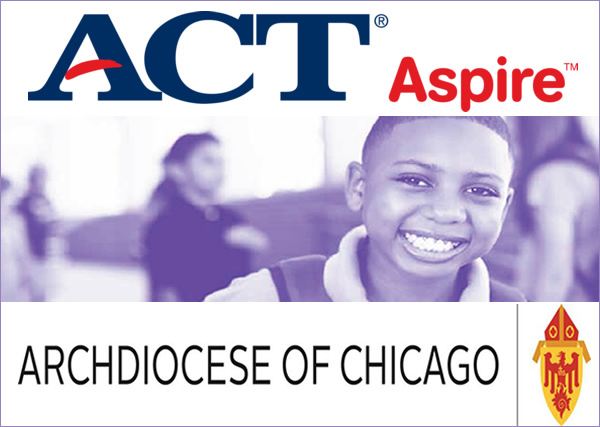 The Archdiocese of Chicago administers the ACT Aspire summative test to all students in grades 3­ through 8. The ACT Aspire assesses students’ academic proficiency in five academic areas: English, Reading, Math, Science and Writing. Students complete this exam over four mornings at their school. ACT Aspire is aligned to the rigorous curriculum standards that inform classroom instruction in all classrooms across the Archdiocese. More information about the ACT Aspire, including grade­-level test exemplars for each subject test, can be found on www.discoveractaspire.org.